Does Your Texas Home Have Adequate Attic Insulation? Home / Articles / Does Your Texas Home Have Adequate Attic Insulation? With high temperatures typically reaching into the 80 and 90s for several months out of the year, Longview area residents are always looking for effective techniques to help keep their indoor living spaces comfortable and cool. Attic insulation is one of the most effective ways to keep your home cool in the summer and warm in the winter. Even when temperatures get cold, energy-saving procedures can help maintain indoor comfort while reducing the amount of energy used and the amount of money spent for heating. The following short guide should help you understand answers to questions about why attic insulation is important and what's required for an effective insulation project. The fundamental purpose of insulation is to stop the flow of heat from warmer areas to cooler ones. When heat flow is slowed or stopped, heat from the outdoors has a harder time getting into your home in winter. At the same time, during cooler months, more heat is kept inside your home if it has adequate levels of attic insulation. Summer heat can affect your indoor living spaces by heating up the attic. When the attic warms up, the excess heat radiates downward and increases temperatures in living spaces under the attic. In winter, as you run your heating system to boost indoor comfort, the heat you've paid for will tend to rise. The heat can move through the ceiling and into the attic, where it then escapes your home. Attic insulation can help prevent these heat-related scenarios. As a result, you are less likely to run your furnace, heat pump or air conditioner at a higher level to compensate for heat gain or loss. You'll spend less on indoor comfort and will reduce excess wear and tear on your HVAC equipment that can lead to malfunctions and breakdowns. Loose-fill insulation is made up of pellets of heat-resistant material such as cellulose (usually recycled newspaper), foam and fiberglass. The pellets are blown into your attic spaces using specialized equipment that dispenses them in even, consistent layers. The pellets fill up open spaces in your attic floors and walls. Loose-fill insulation is useful if you have large areas or wall cavities to insulate. It's also a good choice for insulating areas that are difficult to reach with other types of insulation or that have an irregular shape. Blanket or batt insulation is made from spun fiberglass arranged in layers that produce a thick, blanket-like roll of insulation. It's usually coated on one or both sides with heavy paper, thick cardboard or a type of plastic. These coatings make the insulation easier to handle and prevent itching and irritation caused if the insulation contacts your skin. Blanket insulation can be cut or trimmed to size as needed and is usually placed between wall joists, beams and studs. When used on attic floors, it's commonly installed perpendicular to the floor joists. 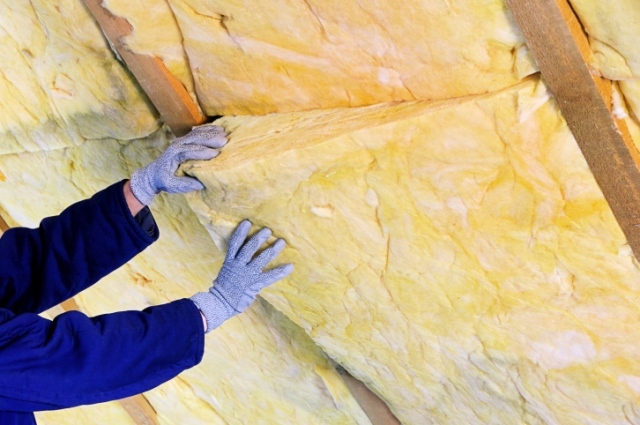 Before choosing a particular type of insulation, make sure you know the material's R-value. The R-value indicates how well the insulation resists the flow of heat. Higher R-values mean better levels of heat resistance. Insulation that contacts light bulbs, light fixtures, electrical outlets, vents and other electrical devices could be damaged by heat or sparks. Contact could also cause the insulation to burn, creating a fire hazard. When installing attic insulation, use sheet metal or wire mesh to create barriers around these electrical devices and prevent insulation from making contact. If you are a do-it-yourselfer with proper tools and equipment, you could most likely do your own attic insulation installation. However, remember that conditions in many attics mean you'll be working in cramped spaces that make substantial demands on your strength and stamina. You also will need the proper protective equipment, such as goggles, protective clothing, gloves, and a respirator or mask. Most of the time, it's a better idea to leave attic insulation to professional installers. JD's AC provides professional heating and cooling services to both residential and commercial clients in Longview and the surrounding Texas communities. Contact us today for more information on how attic insulation can help keep your home more comfortable while trimming monthly household expenses and reducing energy waste. Does Your Kilgore Furnace Go Bump in the Night?Troubleshooting Your Overton Heating System?